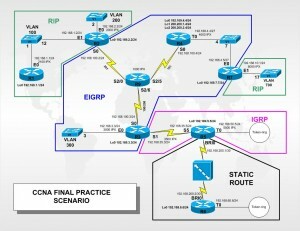 This lab scenario will test your knowledge of all aspects of the CCNA certification. You will configure a network with IP and IPX across Frame Relay, ISDN, Ethernet, Token Ring, and point to point connections. You will also configure and redistribute RIP, IGRP and EIGRP routing protocols. I have also included a GNS3 configuration with VLAN’s substituted for the Token Ring connection and a Point to Point serial link in place of the ISDN. This lab scenario was designed originally using 2500 series Cisco routers and a 2924 Cisco Catalyst switch, so you will need to substitute the proper labels for the serial and Ethernet interfaces for the Cisco router series you are using. Configure the host name as CatSwitch. Set enable password as Cisco. Configure the management address as 192.168.20.1/24 with the Gateway assigned to your terminal or terminal server. Create the VLAN’s as indicated in the network drawing. Assign Ethernet ports to VLAN’s as indicated in the network diagram. Configure Router as a Frame Switch. Configure Frame Relay as hub and spoke on router to use DLCI as shown in network diagram. Configure the host name on all routers as indicated in the network drawing. Configure all routers with no DNS resolution. Configure all routers so that the console session will not time out. Configure all routers to display a banner indicating which router you are logging into. Configure Loopback interfaces on all routers as indicated in the network drawing. Create a host table on all routers using the address assigned to Loopback 0 of all other routers in the network. Configure the IP address and subnet on the Ethernet interfaces of all routers as shown in the network drawing. Configure the IP address and subnet on the Serial interfaces of indicated router as shown in network drawing. Configure the data link layer (Frame Relay) on indicated routers as shown in network drawing. Configure RIP on the indicated router interfaces, including Loopbacks as shown in the network diagram. Configure IGRP AS 20 on the indicated router interfaces, including Loopbacks as shown in the network diagram. Configure EIGRP AS 10 on the indicated router interfaces, including Loopbacks as shown in the network diagram. On R2 and R7 redistribute RIP into EIGRP and redistribute EIGRP into RIP. Insure you can ping 192.169.1.1 and 192.168.10.1 from R5. Insure you can ping 192.169.5.5 and 192.169.10.1 from R1. Configure BRI interfaces on R5 and R6 with IP address as shown in the network diagram. Configure R5 with Dial number 949-3202. Configure R6 with Dial number 949-3201. Make sure that R6 is the only router to initiate a call. Use static route but insure that R6 can ping all interfaces on all the routers. Configure IPX on indicated interfaces of all routers as shown in network diagram. Configure EIGRP as the routing protocol for router interfaces as shown in the network Diagram. Configure IGRP as the routing protocol for router interfaces as shown in the network Diagram. Configure IPX RIP as the routing protocol for router interfaces as shown in the network Diagram. Create a standard outgoing access list on R3 to deny access to users on network 192.168.50.1/24 to the Frame Relay network. Deny http request from reaching R2 E1 interface. Save configuration on all routers and switches. This completes the CCNA final assessment. The solution configuration is available to registered users. This is my first visit to your site. Thanks a lot and keep sharing the information. If just more folks can see it this specific way. Would help make things considerably better without a doubt! Very interesting subject , regards for putting up here . Thank you very much for this entry. Waiting for another one. Hello there – I should exclaim, impressed with your site. I had no trouble navigating through all the tabs and even material was pretty effortlessly to access. I discovered what I hoped for soon in the slightest. Easy spectacular. Would only appreciate it should you add forums as well, much simpler to install a ideal way for your customers to interact. Significant work..
thanks for the great work out here and we from Ghana really appreciate it but i have a problem. i keep getting this error anytime i try to access the downloaded gns3 files. 209-unable to start VM instance ‘ghost-c2600-adventerprisek9-mz.124.15.T7.bin-localhost.ghost’. I am unable to download the topology link. Could someone help me out by providing the link. Thanks a many in advance.